Bobby Valentine is the new manager of the Boston Red Sox. For a franchise trying to overcome the perception of dysfunction, that might not have been the best decision. Valentine is alternately one of the most revered and hated managers in all of baseball, so his presence in the volatile powder keg of Red Sox Nation is sure to provide a spark. Whether that’s a good or bad thing is matter of wildly varying degrees of perspective. During his long managerial career, Bobby Valentine has probably made as many enemies as he has won games. And, it hasn’t taken long for some of them to rear their heads. One former adversary, blogger-extraordinaire Murray Chass, recently suggested (with stats to back it up) the Red Sox hired themselves a bona fide loser. Of course, Chass’ post is dripping with personal dislike for Valentine, not to mention disdain for his former employer the New York Times, so his sentiments can be taken with a grain of salt. However, one element of Chass’ hit piece is based on truth: Valentine is a very unpopular figure because of his outspoken, often arrogant manner. Even though a figure like Valentine in a media market like Boston could become a distraction, likability probably wasn’t item number one on the Red Sox’ wish list. Otherwise, there would have been no need to part company with Terry Francona. However, there is a strong indication of discord within the Red Sox’ organization. If GM Ben Cherington really did prefer Gene Lamont, but was overruled by Larry Lucchino, then the reports of dysfunction within the Red Sox hierarchy might actually be understated. With all the rumors swirling around the Nation, Valentine could turn out to be one of the least controversial figures in Boston over the next few months. 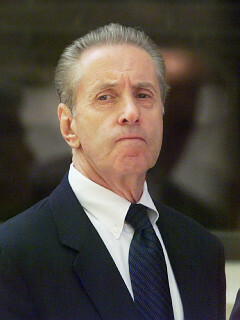 Whenever a team is forced to play a doubleheader, the manager will usually express a universal lament about how difficult it is to win both games. No manager has been more vocal about this perceived dynamic than Joe Girardi, but is it really true? Since the Yankees joined the American League as the Baltimore Orioles in 1901, the team has played 1,746 doubleheaders, although a vast majority took place before the modern expansion era. 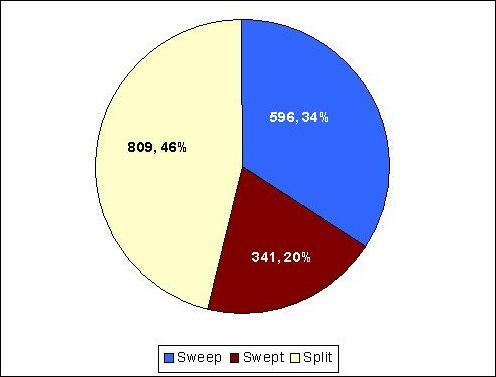 Nonetheless, of that total, the Yankees wound up splitting (including games ending in a tie) or being swept in 1,150 (66%), which seems to lend credence to the age-old concern. Or does it? Are the Mets About to Say Good Bye to the Best Position Player in Franchise History? With the trade deadline drawing near and the Mets headed on a road trip that will last until August, Carlos Beltran’s fly out in the ninth inning of this afternoon’s game could turn out to be his last home at bat with the team. Realizing this possibility, what was left of the Citi Field crowd gave Beltran a nice round of applause, but one wonders if Mets fans truly appreciate how good the outfielder has been during his seven years in Flushing? Although hampered at times by injury, Beltran has enjoyed a mostly productive tenure with the Mets. Based on WAR, he already ranks among the top position players in franchise history, despite having nearly 1,000 fewer plate appearances than many of the other leaders. With playing time factored into the equation, it isn’t a stretch to suggest that Carlos Beltran is the best Mets’ position player of all time. Heading into the second half of the interleague schedule, the American League holds a 66-60 advantage over the National League. If that winning percentage holds, it will continue the senior circuit’s gradual improvement since losing over 60% of interleague contests in 2006. Most experts agree that the American League’s recent dominance of interleague matchups has been the result of having better players and stronger teams. 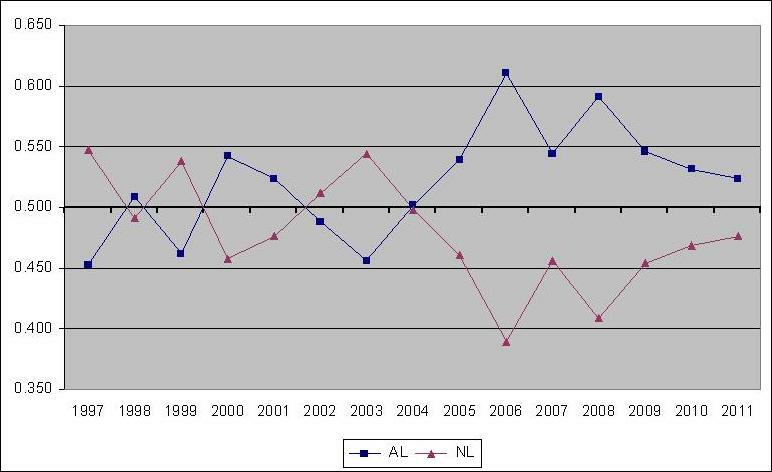 Less clear, however, is whether one league or another enjoys an inherent interleague advantage, all else being equal. For a recent article, I compiled aggregate data for all interleague-related plate appearances, which were defined as follows: DHs hitting in an AL park; pitchers hitting in a NL park; and pinch hitters batting in the ninth slot in a NL park. Not surprisingly, American League DHs posted an OPS that was 0.084 points higher, while National League pitchers outperformed by 0.070 OPS points. What was interesting, however, is that when all of the relevant at bats were totaled, the combined performance was nearly identical. In other words, it seems as if neither league enjoys an overall advantage during interleague play. Jose Reyes entered last night’s action as one of the hottest hitters in baseball, so naturally, the Atlanta Braves’ game plan centered on slowing the speedster down. Apparently, however, the team took that mandate just a bit too literally as even the grounds crew wound up getting in on the act. The Braves were unsuccessful in their attempt to slow Jose Reyes down (Photo: AP). There was nothing unusual about Jose Reyes’ infield single that led off yesterday’s game at Turner Field. It was not only the shortstop’s major league leading 95th hit, but also the 23rd time he started the first inning with a safety. In fact, Reyes’ early trip on the base paths was so far within the realm of reasonable expectations, the Braves had a surprise for the speedster lying in wait. After reaching first base, Reyes barely avoided being nabbed on successive pickoff attempts by starter Jair Jurrjens. On both occasions, the Mets’ speedster spun out with his first step back to the bag, making it seem as if he was stuck in the mud. As things turned out, that’s exactly what happened. 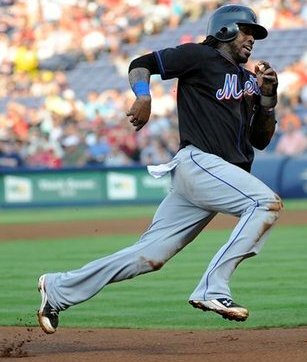 Entering yesterday’s game, the Mets were second in the National League with 60 stolen bases, while the Braves were dead last with 19. Faced with such a significant speed gap, the Braves took a page out of gamesmanship 101 and instructed their groundskeeper to spend some extra time making sure the first base area was well lubricated for that evening’s game. Unfortunately for the Braves, however, first base umpire Bill Miller was not playing along. 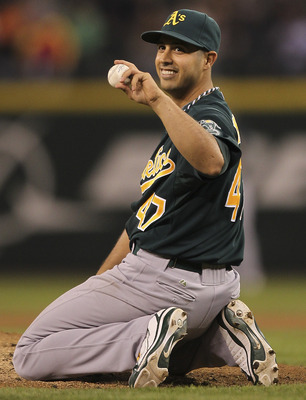 After Reyes slipped for the second time, Miller halted the game and ordered that a drying agent be used to soak up some of the mud conveniently located just about where a base stealer would take his lead. After play resumed, Reyes promptly stole second base, providing justification for the Braves’ pre-game preparations. By the end of the night, the Mets had swiped four bags, including a second steal by Reyes.